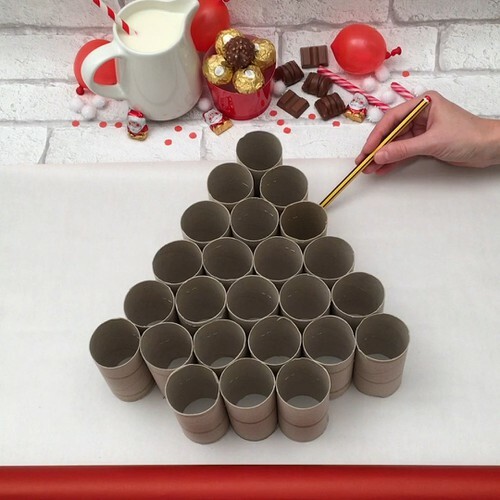 Cut the cardboard tubes in two and arrange them in Christmas tree shape. Staple them together to hold the shape. Place the tree on the wrapping paper and draw around the outline with a pencil and cut it out. Glue the paper onto the tree. Cut strips of wrapping paper the same height as the cardboard tubes and glue them around the tree. Place the sweet treats into the tubes. Make a cut in the middle of the top tube of the tree. Form a loop with the ribbon and tie it with a thick knot, then place the loop in the notch to hang the advent calendar up with. Close the tree shut with a new sheet of tree shaped wrapping paper, and glue the Chefclub stickers on top. Open day after day, and enjoy the sweet treats until Christmas!